When anyone makes six figures on YouTube, you might feel a little jealous. But when it’s an 8-year-old? And it’s six figures per month? That’s when we all question our life choices. Charli has been starring in YouTube videos since she was six, creating short videos with baking tips and tutorials on her channel CharlisCraftyKitchen. Her five-year-old sister, Ashlee, also features in the videos as her helper and professional taste tester. To date, their most popular video shows kids how to make “Frozen”-themed jello popsicles, but you can find tutorials on everything from Easter cake pops to chili. The girls do all their baking without the help of an adult. And people love it: Charli’s channel generates around $127,777 per month in ad revenue, according to data compiled by Outrigger Media. I guess this is unsurprising, given the channel has more than 100 videos and almost 300 million views. Yes, that’s three hundred. Million. And it doesn’t look like these girls are slowing down anytime soon. “I want to make videos until I’m about 100,” writes Charli on the show’s website. Turns out YouTube is a family business. The girls’ Auntie Elise runs the popular channel, My Cupcake Addiction, and even Grandma has a channel called Cooking for Dogs. Under circumstances like these, it would be surprising had the girls not gotten involved in culinary media. Inspired to start making videos of their own, Charli, then 6, and Ashlee, 3, created their first-ever tutorial, Easy Halloween Witch’s Hats, an adorable combination of Hershey’s kisses, orange buttercream icing and chocolate cookies. All it took to get them started was a little help from their aunt and a borrowed room to film a few videos. Charli had always been creative, but Ashlee was the sister most passionate about food. 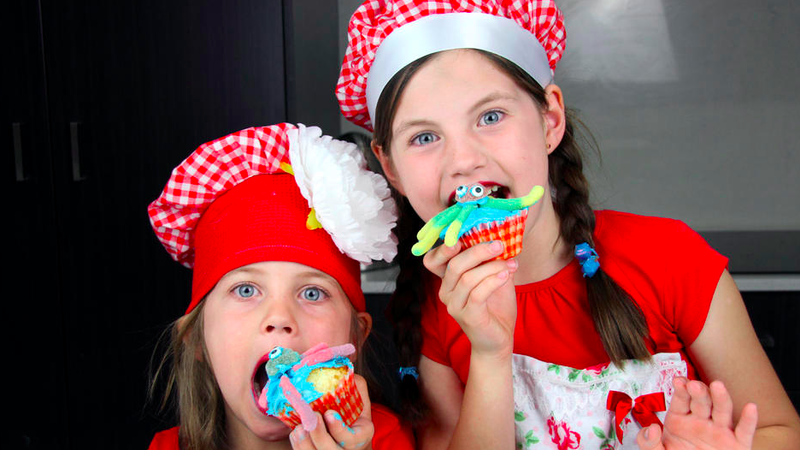 Combining their two loves, Charli’s Crafty Kitchen was born, though their mom, Simonne, said they should change the name to Charli & Ashlee’s Kitchen given Ashlee’s the one who truly loves to bake. The channel grew quickly. The girls partnered with Auntie Elise for a collaboration, which led to partnerships with other popular channels like Bounce Patrol Kids and Elly Awesome. Eager friends and family watched and shared with their friends and families, creating a hit channel in months. While they launched as the first “kids-only” YouTube baking show, the girls now boast the world’s largest show of its kind. “Our lives revolve around YouTube now!” Simonne told me. Given the fact that the channel provides the family’s income, it’s understandable that everyone would take part. This sentiment echoes the one shared by the family behind EvanTubeHD, another YouTube channel where a nine-year-old earns millions reviewing toys. “We work as a tight family unit. Everyone contributes and has their special roles,” they said. Ready to start your own channel? Starting a YouTube channel is completely free and anyone can make money online from their videos by joining the YouTube Partner Program and setting up Google AdSense. Whether your expertise is in payroll or puppets, make sure you’re creating content about something you absolutely love. “That passion will keep you motivated during slower times,” said Simonne. And if you’re not passionate, it will show through in your videos. And of course, the most important thing for any channel is to create good content. “No matter how many people you collaborate with or tell about your channel, you have to have interesting videos so people stick around and subscribe.” It’s obvious Charli and Ashlee have mastered this part. Marian Schembari is a writer, blogger and community manager based in San Francisco.